– Range up to 2000m (based on sound level of 60dB without obstructions, mounted 5m above ground, in still air at 20 degrees Celsius). 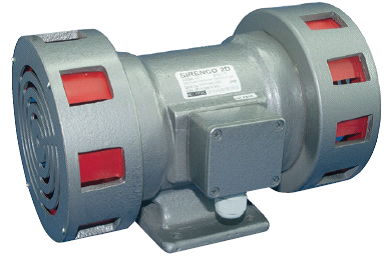 – Single phase motor driven siren. – Sound Output: 121dB @ 1m. – Rating: 1 hour continuous (thermal cutout protection). – Cable Entry: 1 x M20. KAM2D110 110VAC 50Hz 1ph +/- 5%, 3A running current, 24A starting current. KAM2D230 230VAC 50Hz 1ph +/- 5%, 2.2A running current, 17A starting current.